Beauty, and What It Means: The World Hair Cup: Who Makes the Cut? The World Hair Cup: Who Makes the Cut? 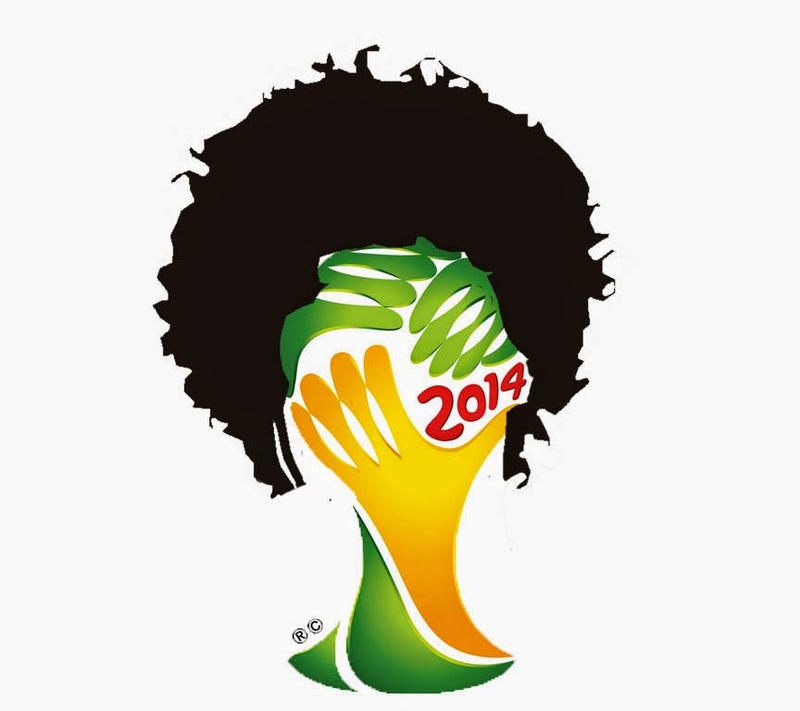 The World Hair Cup 2014 has arrived. And you have a vote. 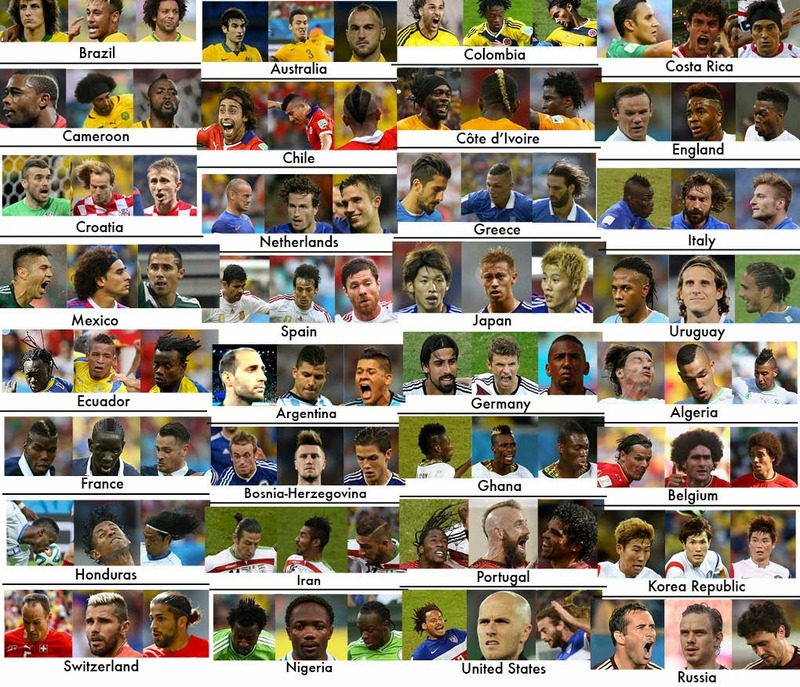 Vote for the team with the most remarkable hair in each group here. Voting for The World Hair Cup will follow the "real" World Cup system and schedule: Group Stage voting will last through June 26, when the two teams with the highest number of votes from each group will progress to the Round of 16 for another round of voting. From there, the winner of each match will continue to quarterfinals, then semifinals, until—at last!—the winner of The World Hair Cup is crowned July 13. (For a visual of how the bracket system works, go here. The sole criterion of The World Hair Cup is team members' hair remarkability. The WHC is about neither good hair, nor bad hair. It is about remarkable hair. As commissioner of the World Hair Cup, I have selected three players from each team as representatives of their team's hair remarkability; photographs of these players are shown on the ballot, but voters are encouraged to conduct their own research. Photographs of all participating nations' team members are available at the FIFA website. Always be ready for change: People who are not ready to change lose and lose big time. Ensure that you understand that things change, circumstances change, people change, fashion changes. Be ready to change with the wave and even stay ahead of it. Only then you will only be on the top. Use these beautiful tips to feel good about yourself and remember always, it is your inner attitude that makes you beautiful in his eyes; not your clothes, not your accessories. The best thing you can ever wear is your smile and that will never go out of fashion.Article Source: Wrighter recently purchased two Juicy couture replica handbags for his wife and daughter. His wife loved the Fendi replica handbags she saw online. Who does not recognize Gucci? Everybody who is anybody has a Gucci handbag on their collection. Unfortunately not everybody could afford an expensive original Gucci handbag and it is more practical to buy Gucci replica handbags that look the same as the original. It is possible that the louis vuitton replica only difference is the price. Why did I say that it is only possible and not the only difference? It is because there are some sellers online that failed to deliver the promise of a great replica. Some would claim that their product as the best replica but when you actually receive the product you feel like you were cut short and instead of being able to save form buying a replica then you end up getting ripped off. One must be careful when buying online because there are a lot of scams in the World Wide Web. Here are some tips for you when buying Gucci replica handbags:Do Your Research Every brand has a trademark that they work hard to establish. But once you see that trademark, you will be convinced that it might be an original. Do your research on these chanel replica trademarks and get to know what it takes to be original Gucci handbags. When buying Gucci replica handbags these trademarks should be present in the replica handbags that you are buying. These trademarks are unique in every brand and every product that you want so my suggestion is to search for the original product that you want online and take down the specification of each product and compare it to the replica. Read on reviews There are many sites that offer reviews by real consumers. Some would even encourage leaving feedback on their site for the rolex replica benefit of other consumers who have doubts on their website. This is a good sign if you are planning to buy from them. Remember that consumers would not lie if the product is not good and the reason why they are giving bad feedback is for others not to fall on the same trap. Respective intriguing content! It is simple to follow through gathered genuine information for me. Great sharing! ray ban wayfarers sunglasses cheap when cheap ray ban aviators sunglasses suddenly remembered one thing, and then said a few words, smiled back Buyetian, while sale of scrap is slowly moving in the cheap ray ban sunglasses australia North plant went. Grass, ray ban wayfarers sunglasses cheap cheap, I am waiting for you to start, how do you come now, ray ban wayfarers sunglasses cheap do not ray ban wayfarers sunglasses cheap be scared of urine in bed last night, got up this morning, wash bedding the bar. The benefits of Oster Classic 76 Universal hair clippers. • Pricing: the Oster Classic 76 Universal Clipper is handsomely priced and tuned to the affordability of many users. September 15th is going to be an exciting day at England's Silverstone Race Circuit as a fleet of over 1000 Ferraris takes to the British track in an attempt to break the Guinness World Record for the "Largest parade of Ferrari Cars " in history. The record was first set at the 2007 Ferrari Racing Days with an impressive 385 vehicles. However, this was beaten later in the year with a staggering 490 cars. It has always been Ferrari's ambition to hit the 1000 car mark and this year is looking promising with over 1000 Italian machines already registered to take part in the record attempt (with car registrations not yet closed). This attempt also follows the recent record set by the Italian car manufacturer for the longest parade of Ferrari F40s which was also held at Cortez Yoth Silverstone. 60 Nike Air Jordan Mens of these 25 year old supercars paraded around the English track in a birthday celebration unlike any other, marking the first time that this many F40s have been on any track simultaneously. Organized by F40 owners and members of the Club, Nigel and Shirley Chiltern Hunt, the Nike Dunk Low Cut mass of F40s registered for the procession and signed on for the Anniversary Parade on the Grand Prix Circuit. The assembled F40s looked superb as the attraction of the Ferrari Owners' Club Ferrari car park, surrounded by 120 other Ferraris. However, the 60 supercars are just a drop in the ocean Nike Air Mission Classic Mens Shoes compared to the huge collection Designer Shoes of cars that will make their way to Silverstone in mid September. The recently revamped Silverstone Grand Prix circuit should have no problem accommodating the mass of supercars in what promises to be a highly memorable spectacle. The record breaking bid will also be for a good cause with 5 for every Ferrari car on the track going to motoring industry charity BEN an organisation that aids automotive industry workers by Nike Soccers providing them with Nike Dunk Mid Mens Shoes residential care. In addition to the massive Ferrari flock, the day Nike Air Presto Leopard promises to be a petrolhead's dream with attendees being treated to displays of the ultra exclusive Ferrari FXX and 599XX development cars as well as a look at F1 cars of yesteryear and a schedule of exciting races including the Ferrari Challenge Pirelli Trophy and the Ferrari Club Challenge. Ferrari also made the headlines this week when a 1957 Ferrari Testa Rossa racecar sold in California for the highest amount ever paid for any car at auction. The price Nike Air Max Mens tag? A measly $16.4 million. This one probably won't be joining the procession as it will no doubt be kept under tight lock and key!. Comfortably Worn: Review of "The Worn Archive"